Should illegal immigrants be sent “Only” to Sanctuary Cities? Pro-illegal immigration advocates are fighting President Trump’s efforts to keep illegal immigrants out of the United States. Trump wants immigrants to enter the USA LEGALLY and in a controlled manner so as not to tax the local economies of their resources that will burden the local law abiding citizens. President Trump is telling illegal immigration supporters; I hear you and am giving you the chance to practice your advocacy. You will receive all the benefits you foresee from illegal immigrants. At the same time, Trump is telling illegal immigration opponents; I hear you and will not force you to bear what you see as costs to your communities. There are consequences to whichever side is wrong, and that’s not a bad thing, either. Those communities that shun illegal immigrants will not receive the benefits, if it turns out they exist. On the other hand, those who welcome illegal immigrants will have to bear the costs or other negative consequences, if it turns out that they were wrong in their assessment. "So with this in mind, sanctuary cities and states should want to do all they can to keep illegal immigrants from being sent to less welcoming places -- and welcome them to their home area. The best places for the immigrants’ welfare would seem to be where local policies and laws favor them. 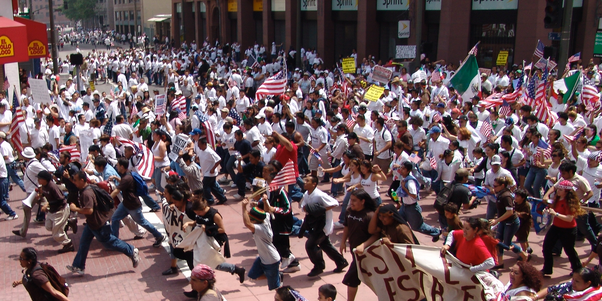 For example, where they can receive driver’s licenses, social welfare benefits, in-state or free college tuition and free medical health services, and free housing at the cost of ILLEGAL IMMIGRATION---PRO-ADVOCATES who are resisting the President’s efforts to bring in immigrants into the United States –LEGALLY. Within a year, there’s a pretty good chance we would be able to see which side of the issue is closer to being correct. Pro-Illegal immigration or Anti-Illegal immigration. Should illegal immigrants be sent to Sanctuary Cities only. I say if they wanted them before, send all of them to those locations. They won't be getting any tax revenue off of those folks, and they will be using all their resources. My only question would be how long will they hold out before crying "Uncle". As it is these sanctuary cities serve as stopping points for many of these people. I would say, not more than 6 months top- for them to cry uncle.They just need a little taste of their own medicine. yes. establish sanctuary cities in Nigeria, and other countries they come from.